The Scam-Block-Plus browser extension provides a layer of protection from online phishing scams. Online scams spread by abusing the share mechanisms of popular social networks and/or by sending e-mails. Malicious scam posts and comments try to tempt you to click on a link that brings you to a scam website. ScamBlockPlus is an anti phishing extension that protects you when this happens. a tab is opened in which the destination website is displayed. and thus is an "untrusted website" then the tab is actively protected by ScamBlockPlus. Notice that the black scam-block-plus incognito-icon replaces the red scam-block-plus shield-icon. This informs you that ScamBlockPlus prevents the website from doing things that could compromise your security. While visiting an untrusted website, your ordinary cookies are hidden from the website. Thus the untrusted website can't share, like, or tweet on your behalf. Untrusted websites are prevented from receiving textual input from you. This blocks scams that trick you into logging-in or into typing and exposing your personal data. to prevent scams from injecting viruses into your computer. are opened by other applications such as Word or Acrobat. 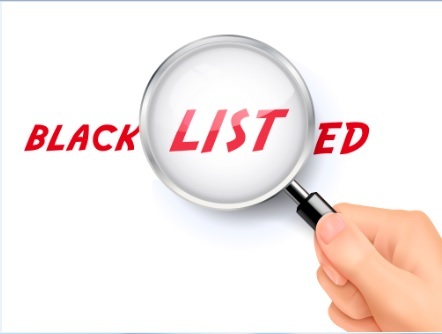 By a simple click on a button you can trust a website that is not listed on the global trust-list. Scam-Block-Plus protection will be turned off for this website. At any time you can untrust a website previously trusted by you. that the website is legit and not a scam !!! 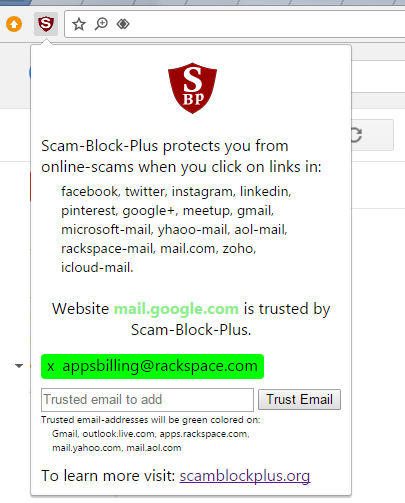 Scam-Block-Plus is not an Anti-Virus, but an Anti-Phishing tool. McAfee on the other hand is an Anti-Virus. Read a side by side comparison between Scam-Block-Plus & McAfee. According to FBI Since January 2015, there has been a 1,300% increase in identified exposed losses, now totaling over $5 billion. of money to a specified bank-account. by replacing a single character with a similar one, for example: &apos;i&apos; is replaced by &apos;1&apos;. ScamBlockPlus marks emails arriving from the CEO or CFO with green color. Thus, the accountant can&apos;t be fooled to think that a fraud mail has arrived from the CEO or CFO. EL AL Israel Airlines is the largest airline in Israel. The name EL-AL means "To the Skies" or "Skywards" in Hebrew. guaranteeing 2 free airline tickets for participating in a survey is a false announcement. 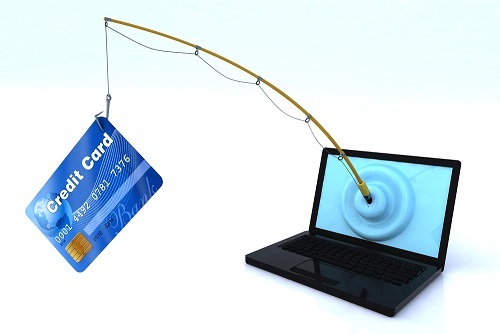 Some phishing scams are targeting the general public. 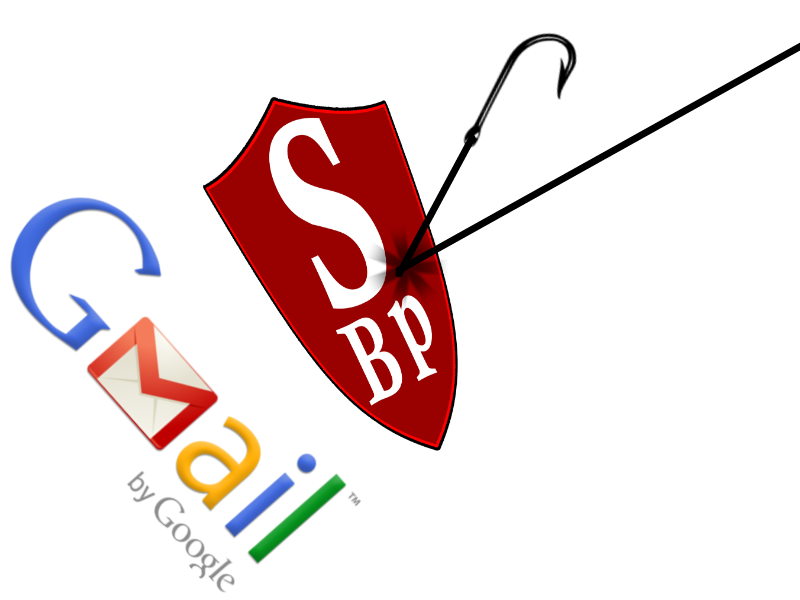 For example the Google Docs Phishing Scam targeted all Gmail users. The fraud was viral, thus only a small number of starting Gmail addresses were needed to launch the attack. Other phishing scams like BEC CEO phishing scams attack specific employees working for victim companies. The scammers must find the email address of a small number of employees plus the email address of their CEO. This is not too difficult. However, in medium-size phishing scams the attacked population is large, yet specific. As an example lets examine the DMV phishing attack on 1 June, 2017. To be effective the fraudsters needed to harvest email addresses of New-York drivers. According to Cnet the Google Docs phishing scam relied on OAuth exploitation. With OAuth exploits, as in the case of the Google Docs scam, accounts can be hijacked without the user typing in anything. In the Google Docs scam, the attacker created a fake version of Google Docs and asked for permission to read, write and access the victim&apos;s emails. Google quickly shut down the attack, which affected about 0.1 percent of Gmail&apos;s users (at least 1 million people being compromised). Scam-Block-Plus blocks this kind of phishing scams. While browsing the fake website you are signed-out from Gmail and you can&apos;t sign-in. Thus the fake website can&apos;t get your permission to access your Gmail. 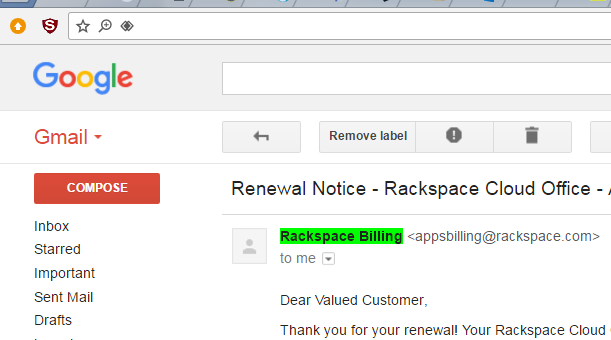 If sign-in dialog will be displayed you will not be able to fill in your details. Incognito windows enable Chrome users to browse the internet anonymously. must sign into his/her Facebook/Twitter account to read posts/tweets. following a post he/she is no longer incognito and is exposed to phishing scams. ScamBlockPlus protects Chrome users in this common scenario. More: Chrome Incognito and ScamBlockPlus Incognito Compared. After installing Scam-Block-Plus, we&apos;re feeling a lot safer from online-scams. In addition to the protection it adds, the support is very professional and kind.